From 1 July 2018 food businesses must comply with labelling requirements set out by the Australian Government which aim to provide consumers with greater transparency on the origin of their food. First introduced on 1 July 2016 as the Country of Origin Food Labelling Information Standard 2016 (Standard) the implementation of the Standard has been impending for some time, with many businesses utilising this transition period to ensure that their labelling is compliant. The two types of country of origin labels which companies selling food in Australia must comply with are the standard mark and the country of origin statement. The standard mark is to be used for products that are grown, produced or made in Australia. 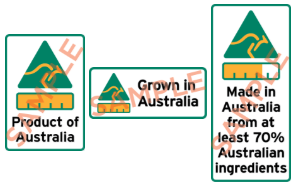 The mark includes the kangaroo in a triangle logo, a bar chart which indicates the percentage of Australian ingredients and explanatory text which outlines whether the product is grown, produced or made in Australia and the percentage of Australian ingredients. When a standard mark cannot be used, this statement provides a clear indication of where the product is produced, grown or made. The Australian Government’s business.govt.au website is a great resource to assist companies in understanding and implementing the new labelling requirements. The Australian Competition & Consumer Commission has also released multiple useful guides for businesses (found here, here and here). The new requirements have come in – now what? From 1 July 2018 foods which do not meet the new Standard can continue be sold by retailers if that stock was packaged and labelled prior to 1 July 2018. Otherwise, the penalties for non-compliance include penalties of up to $1.1 million for corporations and up to $220,000 for individuals once the new Standard comes into effect. Although there are some ‘safe harbour’ defences against liability based on demonstrating that an ‘ordinary and reasonable’ consumer would not consider the claim to be false, misleading and deceptive, it is preferable to comply with the Standard in the first instance. The relevant Minister has reiterated that the government does not intend to extend the transition period to the Standards, so companies would be wise to ensure they are compliant by 1 July 2018 or risk facing penalties. The implementation of the Standard is not the only impending change to liability associated with labelling. As of 29 June 208 the Commerce (Trade Descriptions) Regulation 2016 (Regulations) will provide for a penalty of 50 penalty units ($10,500) for failure to comply with the Regulations. The Regulations govern which classes of goods require labelling when imported into Australia, what label is required and where the label must be applied. Previously, the Regulations only provided for offending goods to be seized. This clearly increases risk at the border. As always, if pain persists, please see your friendly customs and trade lawyer.